Watchung is a borough in Somerset County. The Borough of Watchung was organized on April 20, 1926 and covers an area of approximately 6.2 square miles. 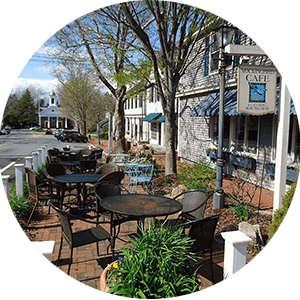 Watchung was settled in the early eighteenth century and grew slowly until recent years. In 1960 the population was 3,312 and as of the 2010 United States Census, the borough's population was 5,801. Shopping and Dining – Blue Star Shopping center is anchored by Kohl's, ShopRite, Marshalls, Michaels and Toys "R" Us. In the restaurant segment, tenants at the property include TGI Friday's, Arby's, Let's Yo, Five Guys Burgers & Fries, Wendy's, and Hibachi Grill & Supreme Buffet. Some of the tenants at the Watchung Square Mall include Wal-Mart, Target, Home Depot, Stop & Shop, Bed, Bath & Beyond, Borders, TJ Maxx, P.C. Richard & Son, and DSW Shoe Warehouse. Among the popular restaurants in town is O'Connor's Beef 'n Ale, an Irish establishment known for affordable prices and a generous salad bar, and the Prime Steak House. Another gathering place is Melissa's Deli, in the Triangle business area, which also includes a florist, a jeweler, a pizzeria, and a Chinese restaurant. 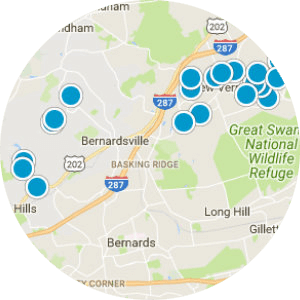 The closest major malls are the Mall of Short Hills, 13 miles to the northeast, and Bridgewater Commons, 12 miles to the west. Parks and Recreation – Kafka Farms sits nestled on 20 acres. The spacious indoor facility is 60’ by 140’ and features 20 brand new 10’ by 12’ stalls as well as a wash stall and tack area. The huge outdoor ring is lighted to allow for night time riding and surrounded by a private wooded area. The 18-hole "Twin Brooks" course at the Twin Brooks Country Club facility in Watchung is a private club featuring 6,640 yards of golf. Other parks include Mobus Field which includes tennis, basketball, baseball, and softball, Phillips Field, Best Lake Picnic Grove, and Watchung Lake Park. 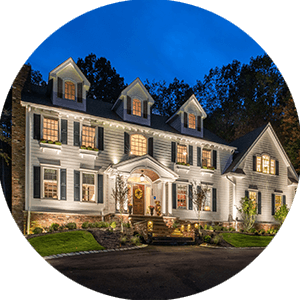 Living – The 6.2-square-mile community of Watchung sweeps across two ridges of the Watchung Mountains, wedged between New Jersey Route 22 and Interstate 78. 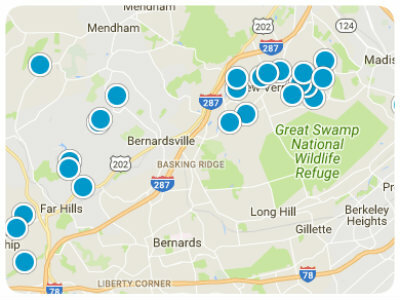 But unlike many other bedroom communities, Watchung offers large properties, undulating hills, narrow winding roads, abundant wildlife and two lakes: Lake Watchung and Best Lake. Schools, Health, Transportation - Students in Kindergarten through eighth grade are educated by the Watchung Borough Schools. Watchung's students in public school for grades 9-12 attend Watchung Hills Regional High School in Warren Township together with students from the neighboring communities of Green Brook Township and Warren Township (in Somerset County) and Long Hill Township (in Morris County). Minutes from some of the top hospitals including JFK Medical Center, Robert Wood Johnson Hospital, Somerset Medical Center, and Morristown Medical Center. It is roughly a 40 minute drive to New York City, and a 30 minute drive to Newark. Newark Liberty International Airport is 15 miles away. "Courtney recently represented my father in the sale of his townhome. My siblings and I were all involved, as my father needed a fair amount of support ... more "
"Courtney was very helpful in helping my wife and I find the right house and negotiate a fair price. She provided valuable insights during the process ... more "
"She is excellent. She knows most of central jersey in and out. She was very patient with us and she was never pushy at any point of the process that ... more "